Beat or Prevent Gum Disease & Tooth Decay Starting Today! There is quite a bit of talk going on about the antimicrobial properties of the sweetener, Xylitol, which is a product manufactured from cornstalks. The dental hygienist community (discussion groups) is where I am seeing most of this and my understanding is that it is a pretty good product as a sweetener and good for your teeth and gums. Something made me wonder, however, about going more natural, and 'honey' came to mind. I wondered about the antimicrobial properties of this natural and healthy food. What I found really surprised me! I was able to learn quite a bit about honey's properties in just a few hours - Yes, honey is a good antimicrobial and has a great number of applications for treating all sorts of ailments aside from gum disease. Everything from eczema to prostate problems are being effectively treated with honey... Honey! Before you run to the cupboard, you should know that the variety of honeys are widely varied in their effectiveness, so not all types are the same. Honey derived from the Manuka (Leptospermum scoparium) bush, found in abundance in New Zealand, claims the highest potency of antimicrobial properties. In fact, Maruka honey's antibacterial factor is unaffected by enzymes in the body that destroy hydrogen peroxide components. (Normally, peroxide isn't considered a good antimicrobial because the body too quickly dilutes it.) It also has an exceptionally high level of plant-derived antimicrobial activity. Antioxidants in honey prevent the formation of free radicals and the nutrient supply of honey is an important factor in new tissue growth, damaged by infection, as well. How is the honey used on the teeth? Some recommend simply rubbing it into the gums after brushing. Since Maruka honey retains it's antimicrobial properties when diluted up to 50 times, it may likely be able to be used as an oral irrigant, when diluted with distilled or filtered water, and injected straight into periodontal pockets using an oral irrigator. (It should be noted that honey is not to be given to infants under 24 months.) If you have an irrigator, you might try it and let us know. If you're already using it, send an email: tom@mizar5.com . For those who would like to see some research, here's a pdf file containing plenty of it: http://bio.waikato.ac.nz/pdfs/honeyresearch/bioactives.pdf In addition, you may go to the Waikato Honey Research Unit web site at: http://bio.waikato.ac.nz/honey/ . And... Is it really Manuka Honey?? • UMF indicates the honey has a high antibacterial component. • UMF is a guarantee and measure of the antibacterial potency of honey. • UMF Manuka Honey (UMF10 is minimum level) has enhanced antibacterial potency giving it special healing qualities. • UMF Manuka Honey is the preferred honey when selecting honey for special therapeutic uses. • The UMF standard is the only standard worldwide identifying and measuring the antibacterial strength of honey. UMF was first discovered by Dr Peter Molan, MBE, of Waikato University's Honey Research Unit. Honey contains an enzyme that produces hydrogen peroxide, a proven antiseptic with antibacterial properties. Dr Molan's research found another more powerful and more stable antibacterial property, called UMF, in some strains of manuka honey. UMF is additional to the hydrogen peroxide antibacterial property. These two properties together have a synergistic effect enhancing their effectiveness. Studies are showing the enhanced antibacterial qualities of UMF Manuka Honey gives the honey special healing qualities. 1. Ordinary manuka honey with only the hydrogen peroxide antibacterial property common to most honeys. A very nice table honey. 2. UMF Manuka Honey with both the natural hydrogen peroxide antibacterial property plus its own natural UMF antibacterial property, giving it increased antibacterial potency. A specialty honey identified by the name UMF. It is the preferred honey for wound dressing and other special therapeutic uses. To distinguish between the two types of manuka honey Dr Molan (honey researcher) and the Active Manuka Honey Industry (AMHIG) have named the additional antibacterial property UMF (meaning Unique Manuka Factor). 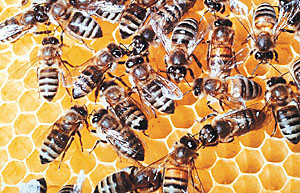 It is unique because it is only in manuka honey and in only some (not all) manuka honey. The name UMF is the seal and trademark of the Active Manuka Honey Industry and is available for use only by licensed users who must meet set criteria. The UMF Standard is an industry registered standard indicating which honey has the special UMF property. The name UMF on the front label guarantees the honey has this special property. The name UMF is a guarantee that the honey being sold has the special UMF antibacterial property to at least the level indicated on the label. It applies only to honey packed in New Zealand and tested after each batch is packed. It does not apply to honey in drums, etc still to be packed, nor to honey not packed in New Zealand. The name UMF is followed by a number indicating the strength of the UMF property after the honey has been packed in New Zealand. A UMF rating of 10 is the minimum. The special UMF antibacterial property is not found in all manuka honey. The presence of this property can be detected only by special laboratory testing. Samples of honey are sent to a specially appointed laboratory for testing for antibacterial activity using criteria laid down by the Honey Research Unit at Waikato University, New Zealand. These tests measure the presence of and level of the UMF antibacterial property. 1. Total Activity rating which measures. Most honeys have a Total Activity rating with activity being due to the hydrogen peroxide property. Total Activity does not identify the UMF property. 2. UMF Activity rating indicates the strength of the UMF property. For this test a catalyse is added to the honey sample to remove the hydrogen peroxide so that all that is measured is the strength of the UMF property. The UMF activity rating is the most important when identifying manuka honey with the special UMF property. 1. In laboratory studies the UMF property has been found to be effective against a wide range of bacteria including the very resistant helicobacter pylori (this bacteria causes most stomach ulcers), the wound-infecting bacteria staphylococcus aureus and escherichia coli, streptococcus pyogenes (causes sore throats). 2. Studies are showing UMF Manuka Honey with high levels of UMF could be very effective in helping relieve stomach ulcer symptoms and gastritis, and when applied topically, in assisting the natural healing of skin ulcers, wounds, burns, boils, cracked skin, MRSA. Studies are also showing the UMF property helps make UMF Manuka Honey excellent for relieving sore throats and oral hygiene. 3. The UMF property is very stable, unlike the hydrogen peroxide antibacterial property common to most honey. The hydrogen peroxide property is easily destroyed by heat, light and water and also destroyed by the catalase effect of the body serum. But the UMF property is quite stable.